Wow, gluten free ginger nuts. These are the best. So many gluten free biscuits taste absolutely awful. I have tasted so many different gluten free biscuits and ended up throwing them in the bin. These little beauties tick all the boxes; spicy, moist, chewy and crunchy. I have a little nephew who loves ginger biscuits, and he can’t tell the difference between the gluten free version and the normal wheat flour version. With a cup of tea what more do you need! This recipe was adapted from “The Farm Kitchen” by Collette Comins. Preheat the oven to 180 degrees and grease a couple of baking trays. I use my Kenwood free-standing mixer for these biscuits. Mix the flours and the butter together in the mixer, then add the sugar and the spices. I then add all the remaining ingredients and mix till the dough comes together. I do find this dough often feels a little wet, don’t worry, rest it in the fridge and bakes beautifully. There are two ways of resting this dough.You can simply cover the bowl of dough and put it in the fridge. When you are ready to bake the biscuits roll the dough into little balls, the size of walnuts, and press each ball with your thumb. This method gives a more rustic biscuit. The second method it a little trickier, but gives a lovely round professional looking biscuit. Take half the dough and lay it on a piece of cling film. Shape it into a sausage and roll it up tight in the cling film, making a tight tube and tying off the ends. Do the same with the remaining dough. This method will keep in the fridge for a few days if you don’t want to bake all the biscuits at the same time. You could also freeze the tubes of dough and bake biscuits when you need them. They can be baked from frozen. When you are ready to bake the tubes of dough, simply slice them up, but don’t forget to remove the plastic before baking. I prefer to slice the biscuit tubes while they are still tightly wrapped in their plastic, and remove it afterwards before baking. This helps to keep the biscuits in a uniform shape while slicing. Leave the dough in the fridge for 1-2 hours to allow it to become firm and easier to deal with. Bake the biscuits till golden brown, this usually takes 10 – 15 minutes. Allow them to cool before removing from the baking tray, as they can be delicate to handle when hot. Recipe makes approximately 32 biscuits. I pop them into a cookie jar and they keep for a long time. My partner is coeliac and I didn’t have any biscuit recipes in my repetoire. I’ve made your ginger nuts twice now and think they’re fantastic. Feeding them to regular friends, they can’t tell they’re gluten free and just think they’re really nice ginger nuts. There is lots of clever little bits in the structure of the recipe that I find fascinating. Many thanks for sharing the recipe. I’m so happy they are a success, we love them too. I have also made the recipe into a Christmas gingerbread house as well, so give that a whirl at Christmas time. 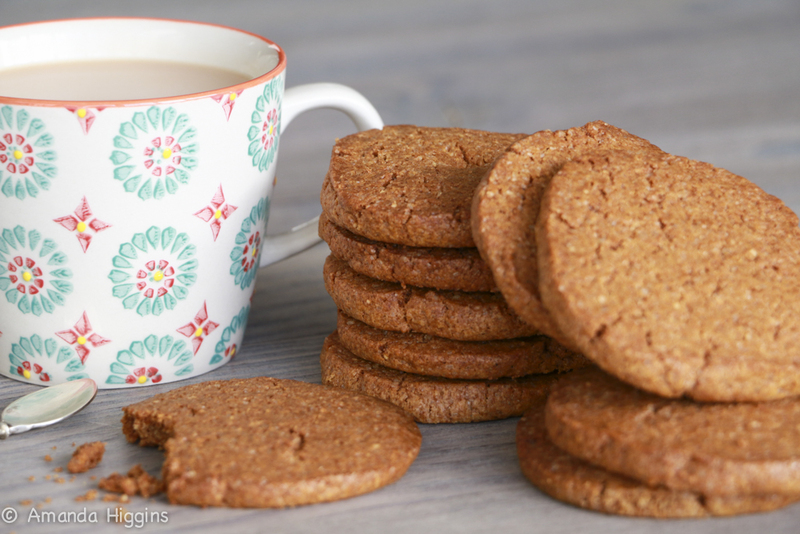 Your images are so inspiring that I’ve been wanting to try one of your recipes for weeks now and finally got to make these Ginger Nuts today. They came out brilliantly. I added some chopped almonds and the children have pretty much polished off the whole lot.